Controlling robotic arms through intentions. Plus, how designs inspired by nature could improve solar panels and make plane wings more flexible, and Ice loss in Antarctica. Using thoughts to control robotic limbs via brain implants is something scientists have been developing for years. But up until now the robotic movements have tended to be clunky, or jerky, as the user had to think through the movements need to complete a task step by step. Now, scientists have developed a way of controlling the robotic arm through the power of intention alone. 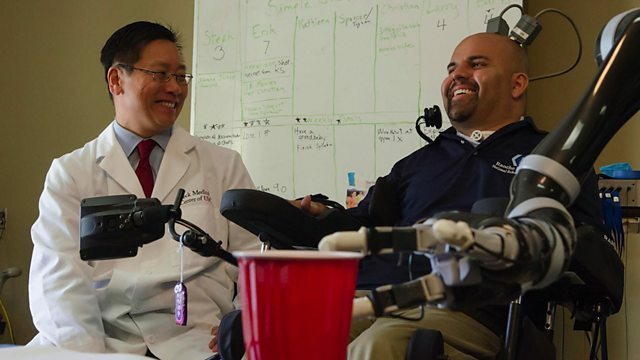 A patient with paralysis has been able to shake hands, drink, and even play rock-paper-scissors using this new method. Richard Andersen from the California Institute of Technology explains this new development. Nature has been working on the solutions to some of engineering’s biggest problems for billions of years. So, rather than reinvent the wheel, scientists are taking a shortcut by studying the ways that animals have already solved human problems. We head to London’s Natural History Museum where scientists are uncovering the secrets of an immense collection of insect specimens and have discovered a biological way to improve the efficiency of solar panels. Presenter Jack Stewart also speaks to scientist Dr Sridhar Kota about how nature inspired his design for a Nasa plane with flexible wings. We may only have scratched the surface of the potential that biomimicry holds. Glacier scientists Jonathan Bamber and Bert Wouters warn us that ice loss is suddenly occurring at an unprecedented rate in a previously stable area of the Antarctic. Jack speaks with BBC Science correspondent Jonathan Amos about what this latest research could mean. Plus, we look at other science news in the last week. BBC Newsround: Could huge lasers on the ISS be used to zap space junk?